Monitor National Marine Sanctuary was established on Jan. 30, 1975, as the United States’ first national marine sanctuary. The sanctuary was established to preserve the unique and archaeologically significant wreck site of the Civil War ironclad USS Monitor. The Monitor was a major technological advancement in warship design and is often called the most significant ship in American history. It sank in 230 feet of water during a storm on Dec. 31, 1862, off Cape Hatteras, N.C., in an area popularly known as the Graveyard of the Atlantic. The wreck of theMonitor is listed on the National Register of Historic Places and is a national landmark. The Monitor sanctuary was designated by the Secretary of Commerce under the National Marine Sanctuary Act of 1972 and is administered by the National Oceanic and Atmospheric Administration’s (NOAA) National Marine Sanctuary Program. The Monitor was the first national marine sanctuary in the National Marine Sanctuary System, which now consists of thirteen sanctuaries and one marine national monument. The mission of the Monitor sanctuary is to preserve, protect and manage the remains of the USS Monitor. Since the establishment of the sanctuary, dozens of research and recovery expeditions have been conducted within the sanctuary. These expeditions have resulted in detailed documentation of the wreck and surrounding area and the recovery of over 1,200 artifacts from the wreck site. Many of these artifacts have already completed the conservation process and are currently on exhibit at The Mariners’ Museum in Newport News, Va. Since the establishment of Monitor National Marine Sanctuary in 1975, numerous research and recovery expeditions have been organized by NOAA and other partners. Recovered artifacts are transported to The Mariners’ Museum in Newport News, Va. for conservation. Once conservation is complete, artifacts are available for exhibition and study. While the majority of the Monitor artifacts remain at The Mariners’ Museum, other facilities including the Richmond National Battlefield Park in Virginia, Civil War Naval Museum in Columbus, Ga., Nauticus in Norfolk, Va., and soon the Graveyard of the Atlantic Museum in Hatteras, N.C., also display artifacts from the historic ship. 1977 – The very first artifact recovered from the Monitor site after sanctuary designation was a red-lens brass signal lantern. It was raised from the ocean floor during the first submersible dive in 1977. 1979-83 – Expeditions in 1979 and 1983 recovered numerous small artifacts and the Monitor’s unique four-fluked anchor. 1980s-1990s – During the 1980s and through the late 1990s, many brief reconnaissance expeditions were carried out to recover exposed artifacts and to further document the wreck and assess the preservation of the site. During these expeditions the researchers began to notice extensive deterioration of the wreck, some caused by recovery operations. The dramatic change in the condition of theMonitor motivated Congress to require NOAA to prepare a preservation plan for theMonitor. 1987 – On March 9, 1987, The Mariners’ Museum in Newport News, Va., was designated the principle repository for artifacts recovered from Monitor National Marine Sanctuary. The museum serves as the primary conservation facility for large and small artifacts recovered from the site. The Mariners’ Museum also displayed a number of smaller artifacts recovered from the Monitor during the 1980s. 1998 – NOAA released a six-step plan for stabilizing portions of the hull and recovering the vessel’s steam machinery and rotating gun turret. With the help of the U.S. Navy, the Monitor’s propeller and 11 feet of the propeller shaft were recovered in 1998. 1999 – Starting in 1999, NOAA and the Navy began planning large-scale recovery expeditions and implementing the stabilization plan. 2000 – Shoring was placed beneath the port armor belt to provide support for areas that hung above the seabed. The engine recovery structure was also placed over the wreck, setting the stage for engine recovery in 2001. 2001 – More than 250 artifacts, including the Monitor’s vibrating lever steam engine were successfully recovered. 2002 – The last of the major recovery expeditions to the Monitor took place in 2002, culminating in the raising of the gun turret and two XI-inch Dahlgren smoothbore guns. The engine, guns and gun turret are currently undergoing conservation at The Mariners’ Museum. 2006 – A team of researchers conducted a major mapping expedition to theMonitor siteto collect high-resolution digital still and video imagery that will be used to generate a high-definition photographic mosaic of the site. The data collected on this expedition will help scientists and historians to monitor the condition of the wreck for years to come. During the same year, the Batten Conservation Laboratory Complex at The Mariners’ Museum opened. This state-of-the-art facility, where scientists study the corrosion process and preserve components of the shipwreck, houses thousands of small and large Monitorartifacts. The conservation facility is open to the public during regular museum hours. 2007 – The new USS Monitor Center opened at The Mariners’ Museum. The sanctuary continues to plan for future archaeological, surveying and mapping expeditions to the site. Monitor National Marine Sanctuary, located on the slope of the continental shelf in the warm Gulf Stream waters, is a suitable place for a variety of marine life. The types of habitats observed within the sanctuary’s boundaries include scattered natural rocky outcrops, sand flats, muddy patches, and artificial hard surfaces created by the Monitor itself and a few scattered artifacts. The sanctuary has high densities of benthic infauna, organic carbon, and a significant concentration of benthic fish and megafaunal invertebrates. An exact census of the Monitor’s bio-diversity has not been conducted to date. The sanctuary was established primarily because of its cultural resources, and for over 30 years the vast majority of research at the site has focused on the shipwreck and her history. As the sanctuary moves further into the 21st century, detailed studies are planned to conduct an accurate census of the diverse marine life, which is known to include varieties of tree coral (Oculina arbuscula); whip corals (Leptogorgia sp. and Lothogorgia sp. ); vase, barrel, finger and garlic sponges (Xestospongia sp. ); sea squirts; sea anemones; barnacles; a variety of hydroids; date mussels (Lithophaga sp. ); oysters (Ostera sp. ); a variety of shrimp, crabs, and urchins; and over 25 species of fishes. A detailed magnetic map of the Monitor site was prepared. The total magnetic field of the site varies from 53,850 gammas on the north and west to 53,870 gammas on the south and east, with a regional gradient at the wreck site of 1.2 gammas per 100 meters. The acoustic system penetrated sediments up to 50 feet deep and revealed four subbottom reflectors that were named for convenience A, B, C and D (from shallowest to deepest). All four reflectors were inclined to the southeast and truncated at the sea floor. The acoustic profiles exposed a 10-meter relief, low-level ridge and swale features in reflectors A and B around the wreck site. The relief was caused by erosion and deposition in a coastal environment during periods of low sea level. The ridge and the swale are evidence of ancient galleys and stream valleys. Also, accumulation of peat observed in the area indicates ancient estuary environments. The presence of the Gulf Stream and the wreck’s location near the northern boundary of tropical reef fish habitat makes the Monitor National Marine Sanctuary very attractive for a variety of marine life. From the surface to the bottom, the sanctuary experiences seasonal migrations of cetaceans, sea turtles and fishes, including sharks and manta rays. Temperate and sub-tropical fish species, such as the greater amberjack, black seabass, bank seabass, scup and grouper, represent the most abundant species that seasonally visit the sanctuary’s waters. Additionally, the sanctuary acts as an artificial reef and provides winter habitat for loggerhead sea turtles. There is only one identified archeological site within Monitor National Marine Sanctuary waters — the wreck of the USS Monitor. The Monitor represents one of the most important naval vessels in the American history. Designed by Swedish-American engineer John Ericsson and constructed in 1862, the Monitor was a significant technological advancement in warship design. The most innovative feature of the Monitor and the one that became her distinguishing characteristic was her rotating turret. Though other designers had toyed with the idea of developing turrets for warships, the Monitor was the first warship to use the invention successfully. It measured 21 feet in diameter and nine feet in height, and its armored walls were made of eight layers of one-inch armor plate. It could rotate two XI-inch Dahlgren smoothbore guns in any direction. The Monitor was built almost entirely from iron and was fully steam-powered. Its engineering spaces, galley, crew and officer quarters were all located below the waterline. The Monitor was launched at Greenpoint, N.Y., where it was constructed, on Jan. 30, 1862. Following final construction and sea trials, the Monitor was ordered to steam to Hampton Roads, Va. On March 9, 1862, the ironclad engaged in battle with the CSS Virginia, a confederate ironclad launched on Feb. 17, 1862. TheVirginia was constructed over the burned hull of the USS Merrimack. In the early morning hours on March 9, 1862, the Monitor and the Virginia began bombarding each other at point-blank range. After four hours, the battle ended in a draw and neither vessel suffered considerable damage. Following the fall of Norfolk and the destruction of the Virginia (at the hands of her own crew) in May 1862, theMonitor steamed up the James River in support of McClellan’s Peninsular Campaign. The Monitor unsuccessfully engaged in an attack on Drewry’s Bluff on May 15 and withdrew with the rest of Union forces to Hampton Roads in July following the Seven Days Battle. Ordered to Washington, D.C. for repairs, she spent much of October undergoing a refit and returned to Hampton Roads in November. She was ordered to Beaufort, N.C., in late December 1862. The Monitor’s short history came to an end on Dec. 31, 1862 as the ship was rounding Cape Hatteras, N.C., under tow by the USS Rhode Island. 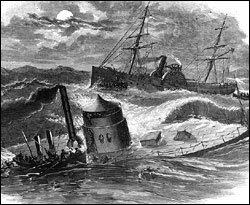 The ships encountered severe weather as they neared the cape. The Monitor began taking on water, and while the steam pumps were initially able to handle the water leaking in from around the turret, a leak was soon reported at the bow. As the storm increased in intensity, it became obvious to her commander that the Monitor was in grave danger. Around 10:30 p.m. Commander John Bankhead ordered a red signal lantern hoisted signaling to the Rhode Island that the Monitor was in danger of going down. 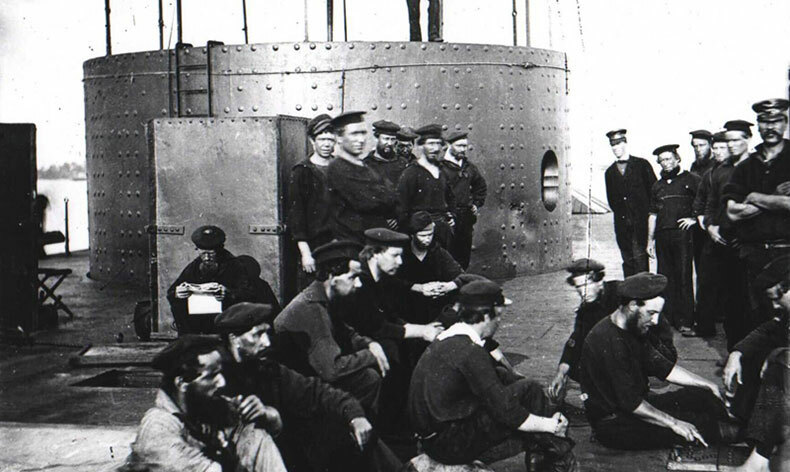 Three boats were launched from the Rhode Island in an attempt to rescue the ironclad’s crew. Through their heroic efforts, all but 16 were rescued before the ship finally succumbed to the turbulent seas just after 1:00 a.m. on New Year’s Eve. In recognition of their heroic deeds, five Congressional Medals of Honor were awarded to the crew of the Rhode Island. Three of these were posthumous.